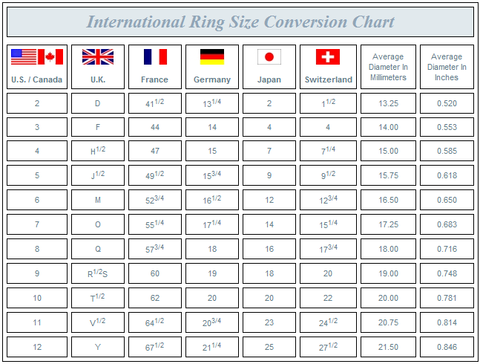 A complete guide to finding your ideal ring size in your countries sizing through a conversion chart and with necklace and bracelet sizing. The following are size charts to help you pick the size best suited to you. If you have any questions or need any help choosing your ideal size, feel free to send me a message here. To find your size in the Canadian conversion find your region or country and your ring size and match it with the Canadian size. When ordering select this size from the drop down ring size menu. This picture gives a great visual to see how long the necklace lengths really are. 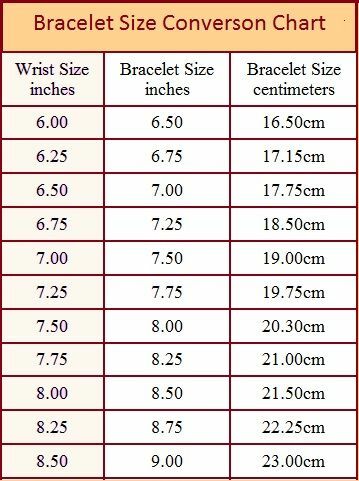 When choosing your bracelet size first measure your wrist. Match your wrist size on this chart and read across to see what bracelet size you will need. Here are the corresponding sizes: Very Small : 6.5", Small: 7", Medium: 7.5", Large: 8", X-Large: 8.5". Now choose your size on the drop down bracelet sizing menu before ordering. If your bracelet sizing is not listed in the general sizing please send me a message and I'll make sure I make a custom size for you!